A report by the University of Gloucestershire has found that Gloucestershire’s own employability project – Going the Extra Mile (GEM) – has achieved more than double its target of moving those furthest from the employment market back into work. The project has already supported 176 people into employment or self-employment, and a further 55 into further education or training. James, who has a disability and has received support from the GEM project, said: “I handed out lots of CVs, and went for loads of interviews, but nobody wanted me. The GEM project has really helped me. I’m so happy to finally get a chance. It’s nice that someone can see beyond the disability, and that’s all people like us need”. With the support of the GEM Project, James is now employed with Specsavers. Since the project launch in 2016, GEM has engaged with over 821 people, well on its way to its target of 1,000 by November 2019. Of these, GEM has helped 269 of these to gain volunteering or work experience, 241 are undertaking actual or practice interviews and 148 people are accessing financial inclusion support. 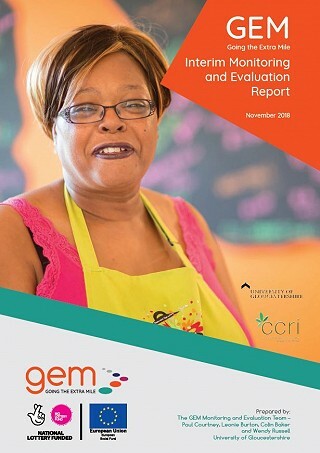 The results have been made possible by the support of over 40 partner organisations in Gloucestershire – including many Voluntary and Community Sector Enterprises (VCSE) – and GEM’s own network of Navigator Developers working within these organisations, who provide 1:1 support to participants to move them into or closer to employment. Roselyn has since completed the Level 2 certificate for working as a Door Supervisor in private security, funded by the GEM Project, and is now in the process of getting her licence.